This chic and luxurious five bedroom villa is an exceptional vacation home and perfect for those who love to entertain and share time with family and friends. The Zen mood is set as soon as one enters, hearing the sounds of the cascading fountain and seeing the lovely reflecting pool. The minimalist décor suits it beautifully. An amazing list of amenities contain the latest in electronics including multiple plasma TVs, an iPod docking station and surround sound. The kitchen here is fit for a chef and an additional food prep area with a freezer and an extra refrigerator are all nice additions. The floor plan includes an open living room and dining area and the main deck provides a large alfresco dining venue. Sagittarius's outside spaces are expansive with loads of chaise lounges for relaxing and sunning and nice 'party' features like a guest bath, wet bar, wine cooler and icemaker. The pool is gorgeous with its fountain and is heated in winter. Steps lead down to a large yard which, come evening, is magically transformed by the outdoor lighting. Three queen bedrooms are located on the main level and the other two are situated on the lower level. They have baths en suite with double-sink vanities. Each has its own unique, striking color scheme and a sea view. A well-equipped fitness room is located near the second kitchen. A 6th en suite bedroom is available for a chef or nanny. 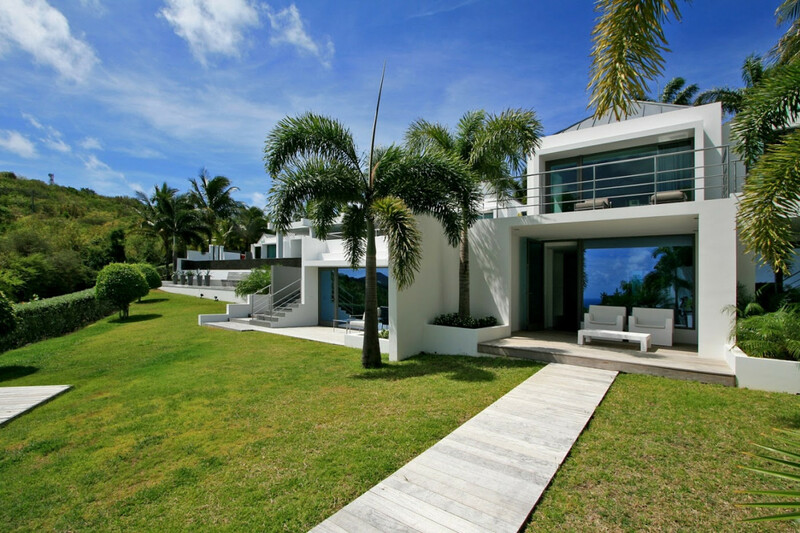 The villa's hillside location provides extraordinary panoramic water views of the entire Baie de St. Jean. This is St. Barth and villa life at its finest. Daily Continental Breakfast is included. A caretaker is available five hours per day (including turndown service) , with additional time by arrangement.